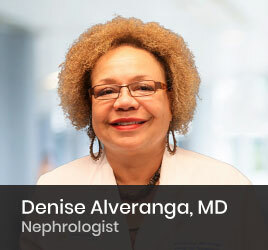 Dr. Alveranga was chairman of the United Network of Organ Sharing (UNOS) Minority Affairs Committee from 1994 to 1996. She has also served on the UNOS Board of Directors. Additionally, she holds appointment as a Clinical Assistant Professor at USF Morsani College of Medicine. She has published articles in well-known medical journals including the American Journal of Transplantation and Nephron. Prior to joining Florida Kidney Physicians, she was part of Tampa General Medical Group. She continues to provide expert services to the Tampa General Hospital Kidney/Pancreas Transplant Program. She serves as the Medical Director of Inpatient Dialysis at Tampa General Hospital as well as Medical Director of DaVita Temple Terrace Dialysis Unit.